Mom, the Intern: Greek yogurt banana bread. About ten years ago, when I was a young newlywed up at BYU, I saw two blackened bananas on my kitchen counter. The thought dawned on me that when I lived at home, my mom would take those old things and lovingly mush them to tar to make banana bread. Suddenly, I had an itch to craft a loaf of banana bread for myself and even impress my new husband with it. But I didn't want it to turn into some dry, dense crap. I knew I could make something amazing with the right recipe. I Googled "moist banana bread" (yeah, a lot of people hate that word, "moist," but how else do you describe non-dry bread?) and a recipe came up which included sour cream. Sour cream will definitely yield moist bread, right? I thought. It sounded like a great plan! I printed it and got to bakin'. After an hour in the oven, I pulled the loaf pan out and could tell by the appearance of it and its divine scent that it was a work of culinary art. I later popped out it out of the pan onto a cooling rack and marveled at its beauty. The cinnamon-sugar dusting on the crust made it sparkle with deliciousness. I cut a warm slice, took a bite and WOW. It took all I had within myself not to eat the whole loaf on the spot! I refrained, though, and shared some with Dill. He was impressed, too, and he didn't even like banana bread. I had found a winner! 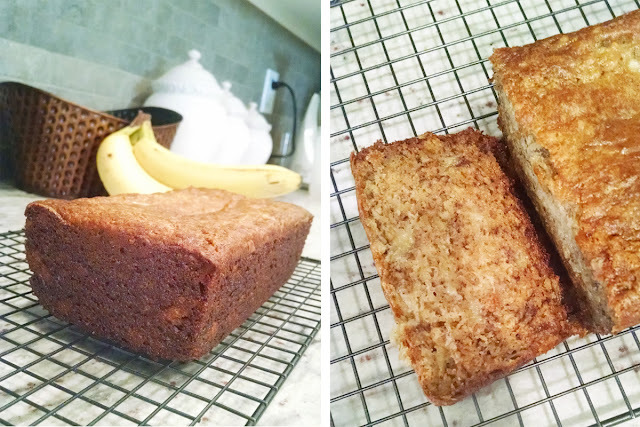 Since then, I've tried other banana bread recipes, but nothing compares to this one. Recently, I began substituting plain Greek yogurt for the sour cream as I always have some on hand. Bonus: it has twice the amount of protein in it as sour cream! Also, this recipe is so easy. SO EASY. You can't screw it up, and you probably have every ingredient in your house, except for maybe two over-ripe bananas. But never fear -- you'll have some tomorrow or the next day. Haha. Note: pictured bananas are NOT RIPE ENOUGH. Only present for aesthetic purposes. Grease the bottom and sides of a standard 8.5" loaf pan with shortening (I use a paper towel to rub it on). Sprinkle cinnamon-sugar mixture into pan and move the pan to coat the shortening evenly. Cream the sugar and butter together. Add the egg, bananas, yogurt, vanilla and cinnamon and mix well. Pour into greased-and-sugared loaf pan. Bake on center rack for 1 hour at 300 degrees. Make sure the middle is cooked through by inserting a toothpick -- if it comes out clean, you're good! If not, give it another 5 - 10 minutes. Set pan on a cooling rack for 10 minutes before turning pan over to remove the loaf. Allow loaf to sit for another 10 minutes before slicing.